New technology works by shaming drivers who try and abuse the system. Russian drivers who try and park in spaces reserved for disabled people could be in for a shock if a new system installed at several Moscow shopping centers catches on. 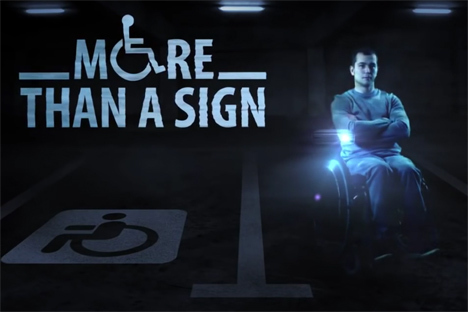 The system, launched back in May 2015 by Dislife, a Russian website dedicated to people with disabilities, with assistance from the Y&R advertising agency, works using a special camera which monitors the disabled parking space to check whether cars attempting to park there have a disabled parking badge. If a car without a badge tries to enter the space, a hologram of a man in a wheelchair appears in the air, crying: “Stop! I am not an empty space.” The hologram is projected through tiny drops of water diffused in the air. The main goal of the initiative is to raise awareness of the misuse of disabled parking. Since its launch the video about the campaign has been viewed over 3 million times. Paid parking first appeared in Russia only in 2012 and so far has been operational only in Moscow and several districts of St. Petersburg. The problem of illegal parking in disabled parking spaces is still a very acute problem in Russia.